If you've been following my blog for any amount of time, you'll know that I absolutely adore this series. I have yet to not dislike a book in the series. This series wasn't originally planned to be twelve novels long (with a few novellas), and so every time I saw a new addition, I couldn't wait to read it. Sadly, this is the final installment in the series, which is a little heartbreaking. But it is an adorable and very sweet story that wraps up the series perfectly. This novella takes us back to where it all begin - at least, back to a character who has been in the series from the start. Mary Whitsun is the beloved "Mary" of Temperance, who is now Lady Caire. Temperance is the heroine of Wicked Intentions, book one. She and her brother Winter ran an orphanage in St. Giles, and Mary Whitsun was one of the first girls to arrive. She had been at the orphanage for the longest, and she came with Lord and Lady Caire when they married. After years in the orphanage and years as the Caire children's nursemaid, life is about to change drastically for Mary Whitsun, when someone mistakes her to be Lady Joanna Albright. The story begins with Mary in a bookstore, sensing someone watching her. Lord Henry Blackwell comes up to her and mistakes her for Lady Joanna, his fiancee. But he quickly realizes that while she looks like Lady Joanna, she isn't. The next day, Lord Blackwell arrives at the Caire residence with Lady Albright (the mother), and the grandmother. And thus, Mary is whisked into the life of Lady Cecilia Albright, the long-lost twin of Lady Joanna. She is to have lessons on comportment and dancing and all things nobility, and she is to be the one to marry Henry (since he was promised the eldest Albright sister). But a life among gentry isn't what Mary ever dreamed of - or wanted. Even if she has begun to fall for Henry, the dashing lord who she misjudged. I always thought Mary Whitsun would end up with one of the other orphan boys, but I'm glad to be wrong. Mary is fiery and prickly, and she immediately dislikes Henry, even if she is also immediately attracted to him. She loves her independence and doesn't want to be a lady, even if she doesn't really mind not being the Caire children's nursemaid anymore. Mary has worked hard her entire life, but nothing is like working to be the perfect gently bred lady. Lord Henry Blackwell is charming, sweet, and a little roguish. He seems playful and charismatic, every inch the aristocratic gentleman. Mary doesn't see this at first, but he is deeply devoted to his family and his family's title, and he is selfless about nearly everything. As Mary gets to know him better, she sees his selfless and noble side. I love this romance because it is hate-to-love, which I adore! Mary doesn't like Henry on the spot at first, and she lets her prickly side show. Henry thinks she is hilarious, and he likes her from the start. 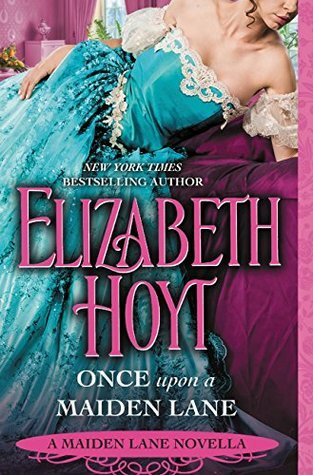 The two of them have great chemistry and the tension builds between them, even when Mary thinks she doesn't want an aristocrat like Henry. They are a great match and they understand each other. It was so adorable to watch them fall for each other. The romance was sweet and so lovely! The conflict of this novella mainly deals with Mary Whitsun being the long-lost Albright twin, who disappeared the day she was born. Is Mary the missing twin? And who is trying to kill her, just days after Henry discovers her? The book does not end as you think it might, for both Mary and Henry. I loooove the ending of this novella, because it ties in literally EVERYONE from the original trilogy in this series. Meaning, most of the Makepeace family, and the Reading family, but we also see the Huntington family and extensions (like Bridget and Val). I can't remember if we see Silence and Michael. We see many members of the Wakefield family (like Phoebe and James), though I'm drawing a blank if we see Artemis and Maximus. I so wanted a cameo from them because of their little bundle of job that was hinted at, in one of Hoyt's holiday check-in extras. In any case, the ending of this book is perfect because everyone is a part of it. This made me so happy and a little sad too. Everyone is all grown up! These aren't even "my" book children and yet I'm so proud and happy. I can't even imagine how Hoyt feels! I don't usually read novellas because they're so short and I often want them to be longer. But this novella was perfect in length of density - the story felt complete full. I definitely recommend the novella because it really makes the series feel final. I really recommend the entire series if you love historical romance. I am pretty sad to see this series go, but I am also interested to see what Hoyt will come up with next too. Aw, I'm sorry that this is the final book in this series. But YAY for it being a good one at least :D And so glad you have liked all of them. <3 The romance sounds all kinds of awesome.